As a newbie climber, I can fall into the trap of continually comparing myself to other, more experienced climbers. From this perspective, other climbers are the competition, and their successes make me look like a worse climber in comparison. I’d see someone scend a hard route and think, “I will never be that good.” Not the healthiest of attitudes. Which is why I’ve preferred to climb when the gym is almost empty. 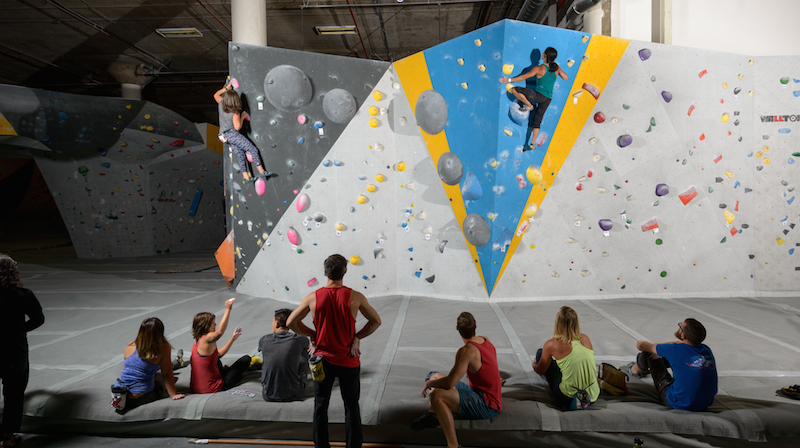 Recently a set of new routes became available on one wall of my gym. Pristine, new routes with no grades yet. A bunch of us of varying abilities were sitting on the mat just checking out the new routes. Someone would get up and tackle one of the new routes. We’d watch, encourage them, and give tips, and then cheer for them however they did. It was a little intimidating, since there were some very good climbers among our little huddle. I would go up and try a new route, make a little progress, not scend much, but still enjoy the attempt. Another climber would give me props, or provide advice in a friendly way. I shifted into a new frame for looking at myself in relationship to the other climbers. It felt like all of us were working together to tackle the wall, to solve the new problems. It was us versus the wall. It felt good. I need to remember this whenever I feel like I’m not good enough, and that other’s achievements intimidate me. We’re all tackling similar problems together. Their successes are my successes, and vice versa. We’re all in this together.